Is the semiconductor industry back from the dead? New CEO? No. Ready to better compete against the rising star that is Advanced Micro Devices (AMD - Get Report) ? Hmm. Barclay's did downgrade the name just yesterday, while cutting the price target. Perhaps the firm is ready to take on Nvidia (NVDA - Get Report) , best in breed across a wide swath of cutting edge technologies including the data center. Now... it would really be something if a firm that has now gone seemingly forever without a CEO could put up their dukes and fight the good fight versus the likes of industry superstars such as Lisa Su and Jensen Huang. Yet, here we are. Intel (INTC - Get Report) . Willie Mays in 1973. Tired, former champion of the world. The beleaguered Intel is up this morning significantly on good volume. In fact, the best volume that we have seen not closely tied to a ringing bell with the exception of interim CEO, and current CFO Bob Swan's open letter that the firm published on Friday. The name did gap up on that letter, then gradually sold off over two days as short term traders took profits. Now. Pop. The rise of Intel resumes. Has the death, or decay of the semiconductor industry been greatly exaggerated? Nvidia seems to be relentless, up roughly $20 since late last week. You read Evercore ISI analyst CJ Muse. He flatly claimed that Nvidia has become an industry standard for artificial intelligence, and is now building a competitive moat around that business. Don't forget gaming, the firm's bread and butter. Muse has a $400 price target. I had a $280 PT on my long position, and I have not acted yet. Time tested discipline requires that I have to take something off, but what a beauty!! Now, was Swan's letter a desperate move? Doesn't sound like it to me. Swan flat out tells you, "The continued explosion of data and the need to process, store, analyze, and share it is driving industry innovation and incredible demand for compute performance in the cloud, the network, and the enterprise." Pretty powerful sentence. Okay, that said, we know that there is a shortage. Is this a good problem, as in having more than a few power hitters in one lineup? Or is this the kind of thing that relegates a once powerful home run hitter to the bench. Again, Swan lays it on the line: "We are investing a record $15 billion in capital expenditures in 2018, up approximately $1 billion from the beginning of the year." He tells you that he is going to meet demand with supply. Valuations are low across the semiconductor industry. I mean if you're not AMD or NVDA. Was there room for Moose Skowron in the same lineup as Micky Mantle, Roger Maris, and Yogi Berra? I want you to think of the data center (the cloud), artificial intelligence, machine learning, autonomous driving, gaming, and even crypto-currencies. They all need what these firms provide, not too mention your cell phone and that hunk of junk sitting on your desk. Hard to see any of these business lines not continuing to grow in the foreseeable future. Value vs. Growth? NVDA vs. AMD vs. INTC? 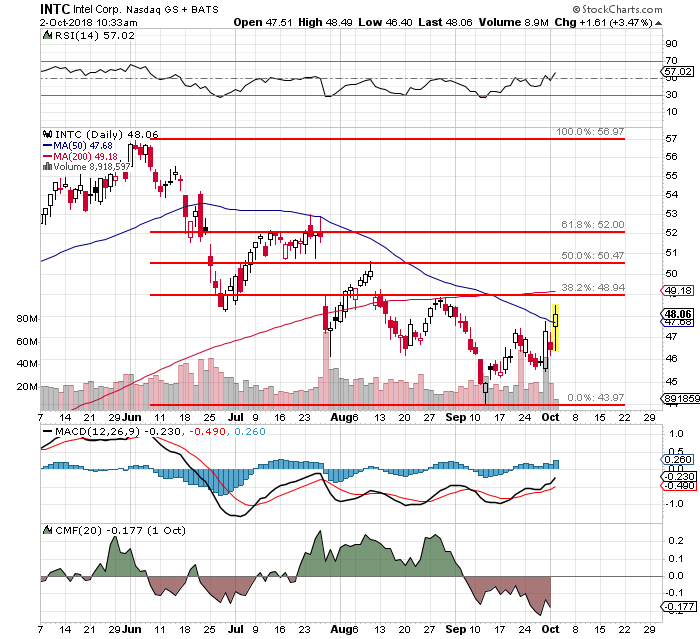 INTC is the value investor's choice here in my opinion. I think that if the firm were to promote someone to the chief executive position from within, that we would have known by now. Should this gang ever gets off their tail, and hire a permanent CEO, I think the name rallies on that news. Should the name be a headline grabber, all the better. It seems obvious that there could be resistance at $49, so we do need a news event to get past that spot. The daily MACD is playing along, but Money Flow is not at this time helpful. -Purchases must be kept to a 6 to 1 share ratio in relation to sales. -Purchase price must be $244.30 or more below sales price. -Intended goal is to better balance the risk between these two names now that NVDA is well beyond my target, and INTC finally presents, in my opinion better reward potential. At the time of publication, Stephen Guilfoyle was Long INTC, NVDA equity. Short AMD, NVDA puts.